Taejongdae is a coastal park, located on the southern tip of Yeongdo Island, which is just across the water from the Nampo area where I live. The subway doesn't go there so you have to take a bus; these can be tricky, since it's difficult to research routes when all the websites and apps are in Korean, but I've found the trick is to search directions on Google Maps, and it will tell you which buses take you there. I'm getting the hang of it now! It took about half an hour to get there, though I have to say, the buses here have limited seats, and you have to hang on tight to avoid swinging around if you're standing, given the way they drive! From the bus stop, it's a short walk to the park entrance, and easy enough to find. Entrance is free, but you can choose to pay to ride the train around the park, hopping on and off at various stops. I skipped out on this though, since the whole point of my day trip was to do some walking. The path through the park is a circular loop, so you can go in either direction, and it's wide road, for the train, with pavements for the walkers, so it's very easy to follow. From the main road, you can take various detours to see the different sights around the loop, before rejoining the main road again. The first I passed led down to a viewing point over the ocean, with this cute bench surrounded by topiaries, which was, of course, flocked to by couples wanting photos there. You can look out from the viewing point to the small beach down below, or you can descend the stony stairway on to the beach itself. This was the first major thing I saw on my walk, and it was so beautiful, which made me quite excited for what the rest of the route might have in store! The beach is pebbled, no sand, and is really just a small cove in the coast. There was a large tent set up, where you could stop off to eat some seafood cooked in front of you, and some locals fishing off the edge of the rocks nearby, but otherwise it's pretty much untouched, even with all the people that must visit (it wasn't too busy while I was there). It was a pretty spot just to stop and admire for a while, before braving the steep climb back up to the road. From there, the path continues to wind through the forest and along the coast, with a few inclines, but nothing too difficult really. The foliage breaks apart every so often to offer up views out to sea, with bright blue waters, interrupted only by the ships sailing by. The next major stop was quite a bit further round, but it was a bright, sunny day, not too warm or cold, which is perfect walking weather for me. After an hour or so, around halfway through the course, I reached the Observatory, which has coastal views completely uninterrupted by foliage. The building itself was actually closed for renovation while I was there, so I'm not sure what's normally inside, but I'd assume it's a good rest stop, with refreshments, for the halfway point. Though the building was closed, the viewing platform was still accessible, and from there you can see Teapot Island popping up out the sea, small and solitary! I also liked looking down (though not leaning over too far, fear of heights!) 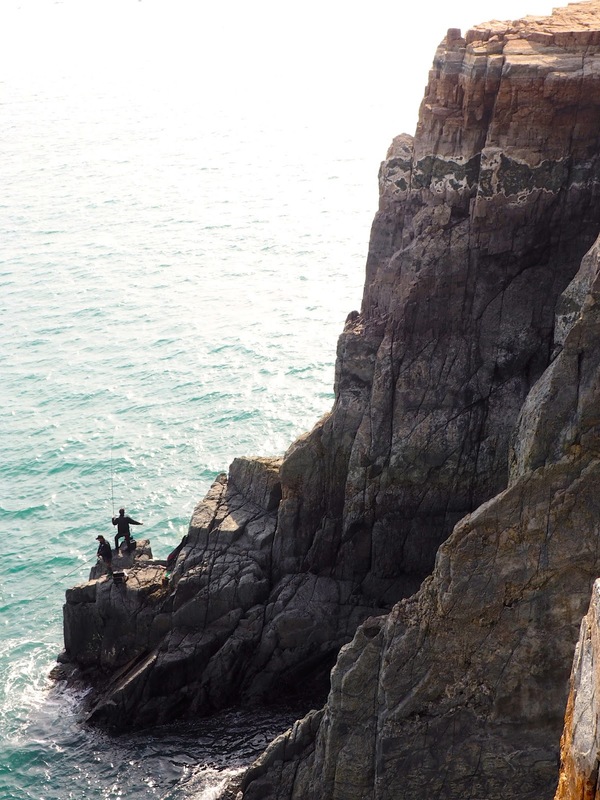 to see the rocky cliffs around, and I could spy people fishing on the rocks below; how they get down there, I don't know! 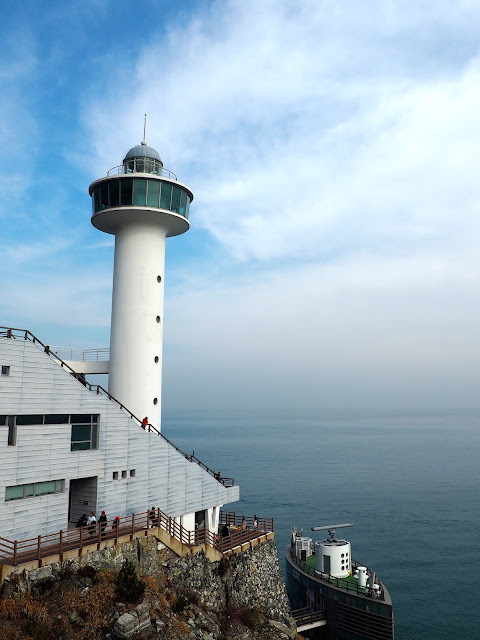 After the Observatory, it's just a few more minutes walking to reach Yeongdo Lighthouse, which is the highlight of the park. If you're taking the train and only have time for one stop, this should be it. There's a lot of steps down the cliffside to the lighthouse at this point, which are easy enough going down, but involve quite a bit more effort to get back up! There are some pretty great views of the lighthouse itself to be had, when you first come down the stairway, as well as out to sea. I visited the lighthouse first, though I opted not to climb the huge spiral staircase to the top, since I doubted the views would be much better - they were pretty spectacular from where I was, on the rooftop platform around the central tower. To the left, there's blue waters lapping against rocky cliffs and coves; down below, there is the stairway leading to more tents serving up fresh seafood, with benches and mats to sit at; and to the right is the Sinseon rock, a large flat outcrop from the cliff-side, and Teapot Island visible again beyond it. 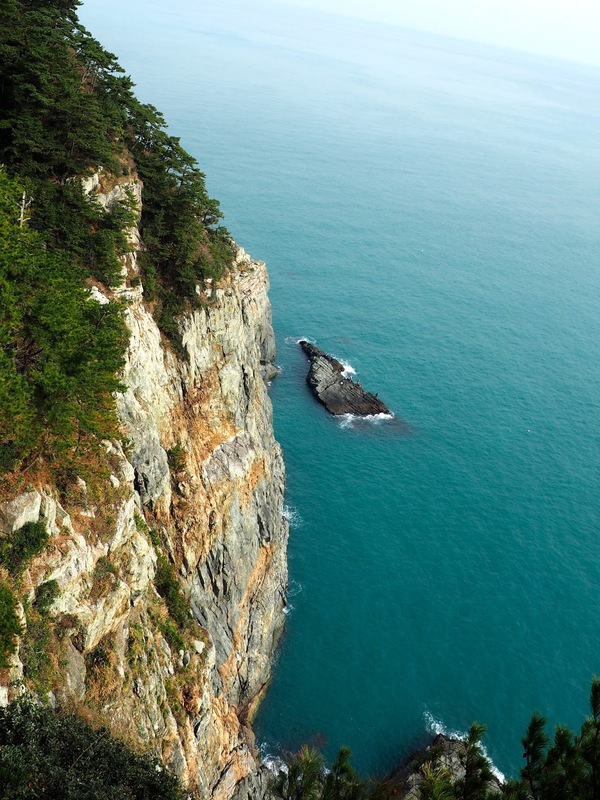 You can walk down to Sinseon rock, which I did when I finished admiring the lighthouse views. The path is pretty rocky, naturally, and could be slippery depending on the weather (I got a nice, dry day), so be careful, but there are roped fences to hang on to. The outcrop is a large, flat-ish surface, full of people taking selfies, or sitting around having picnics, which looked like it would be a nice day out; I spent a couple hours in Taejongdae park altogether, but you could spend a lot longer here is you did something like that. I was a bit wary about going to close to the edges though, as it does just drop away suddenly to the water below, and I was very nervous that one wrong step could have me slipping and falling, so I stayed securely in the middle area! I spent some time looking around and taking my photos, before beginning the ascent back up all the stairs to the road. The last stretch of the loop, leading back to the beginning, didn't have any particularly remarkable sights - there's a small temple and an outdoor fitness area, but that's about it - but it seemed a bit quieter than the earlier parts of the path (maybe a lot of people walk to the lighthouse then take the train back?). It was very pleasant and peaceful though, and the sun was at just the right angle and brightness to light up the foliage all around. Autumn back in Scotland can have a few nice days, but is mostly grey and wet, whereas the bright, dry weather I've been experiencing in Korea is just perfect for appreciating the season. I was surrounded by those perfect autumnal leaves, in shades of red, orange, yellow, and gold, and most of them are still clinging on to the trees! And with the sunlight hitting as it was, I had a lovely half hour or so of walking through the beautiful, warm, bright colours. And then I had completed the loop. I was pretty tired by this point, so I jumped on a bus back again, but there are a whole load of seafood restaurants near the park entrance, for those who want some food after their walk. 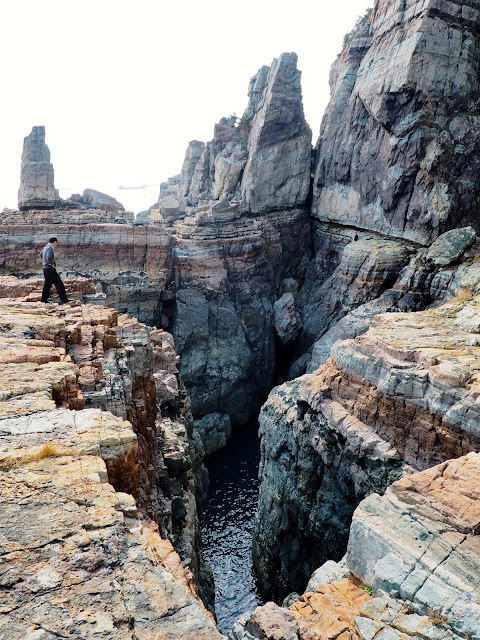 It took me around 2 hours in total, walking at a moderate speed I'd say, and with at least half an hour around the lighthouse and Sinseon rock. It was an easy walk, good for me to start to build up to more strenuous hiking again, and had such lovely scenery, especially with all the autumn colours. It was a nice balance of exercise and relaxation, as I was outdoors and moving around, but it was peaceful and enjoyable. Taejongdae isn't a place I'd heard that much about before, but I'd say it's definitely a great part of Busan to visit if you want to get outdoors for a while. An afternoon well spent! 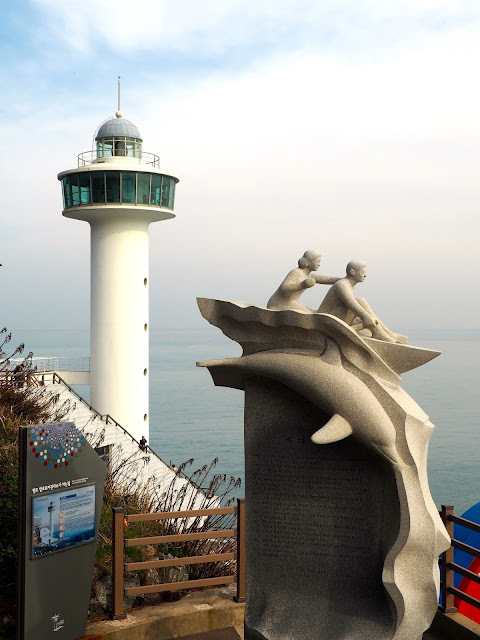 If you're interested in visiting Busan yourself, you may like to look at the Busan 1 Day Small Group City Tour from Trazy Crew, which includes Taejongdae and the Danubi Train. I didn't do this tour, but I am an affiliate for Trazy.